So I’ve been procrastinating writing a review of The Ordinary’s Buffet serum for a while now. Originally, I was just lazy. But then, I decided to try switching to the Hylamide’s SubQ Anti-Age serum. When I started using it, I thought maybe I’d hold my review of Buffet until I had an opinion of SubQ, since Deciem holds up SubQ as a more potent version of Buffet. I’ve only tried two other products from each range: Hylamide’s C25 Booster serum and Hydra-Density Mist, and The Ordinary’s Niacinamide + Zinc serum and Hyaluronic Acid + B5 serum. 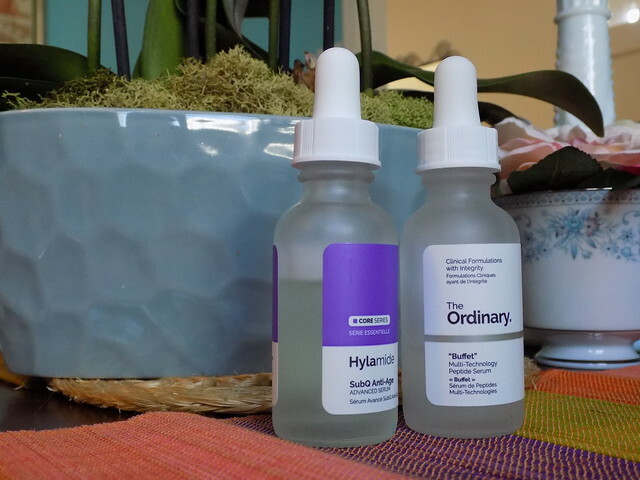 Of the serums, I find that Hylamide’s serums have a more sophisticated texture, in general, though I like The Ordinary’s focus on simple, one- or two-main-ingredient products so you can mix and match exactly what you want. I’ve had a problem in the past with some serums just offering too much, leading me to skip a serum that looks interesting because one of the other ingredients is unwanted. But “Buffet” is a different beast for The Ordinary. As per the company’s description, the name implies a comparison to an all-you-can-eat restaurant. But even this many-in-one formula remains relatively uncomplicated. It’s peptides and hyaluronic acid in several weights. In essence, this is what SubQ Anti-Age is as well. The main difference in description is that SubQ Anti-Age is marketed specifically as an alternative to retinol products for anti-aging. This intrigued me, as I’ve been striving to avoid retinols and retinoids in my skin care routine as something I would have to give up if Fiancé and I decide to have a child. Why find something that works a miracle with my skin if I’m going to have to give it up for a year in the future? No, there’s plenty of time for me to experiment with non-retinol products now and save the retinoids for when I’m older. So on to my own experiences. Buffet was the first serum I tried. As I’ve mentioned before, I have one relatively pronounced forehead line that serves as my yardstick for the efficacy of my skin care routine. I’m reasonably sure that nothing short of fillers or Botox would remove it entirely, but levels of hydration and effective chemical exfoliation will reduce its prominence. I found Buffet to be a perfectly adequate hydrator. It reduced the prominence of my forehead line enough that I felt like it was doing something. But I find find the texture a bit uncomfortably sticky. This is not a serum I would use during the day. Enter SubQ. At first drop, the texture is much more pleasant. It sinks in quickly with much less stickiness. I actually find it absorbs so quickly that I had to play a bit with how I apply it. At first my skin drank it up so quickly, that I had to apply six drops directly to my face and pat it in in zones to get it spread out before it was sucked in. As I’ve used it over the last several weeks, I’ve found my skin a little less desperate to absorb it. That alone suggests that it’s doing something. But then, this happened: I was sitting at our Sunday morning coffee date with fiancé and he stopped looking at his phone and started studying my face. I grew increasingly self-conscious and mildly annoyed and asked him what he was doing. “I was noticing how you have no lines on your forehead when I have a lot of lines on my forehead,” he said. Hmmm, I thought. I looked in my hand mirror and noticed that, indeed, my forehead line had faded to near obscurity. Given that I am nearly three years older than he is, it’s likely that any difference in our skin is down to genetics and good skin care. After that I started looking and noticed that I was regularly seeing less and less of my line. So I definitely find SubQ more effective than Buffet and to me it is worth the extra price. So there is my comparison. I like the Deciem brands because their products seem to be well-formulated and price seems to correlate with activity, but even the lower-priced products are a good quality, well-thought-out product. NB: I purchased both of these products with my own money and have been given no incentive to review them. None of the links are affiliate links. Would you say that Buffet is still worth it as an entry level serum, or would you recommend skipping it entirely to use SubQ? Thanks for your time and opinion! So here’s the thing: I’m not a skin care expert at all. I’m just a person who puts stuff on her face and talks about it. So I can’t really tell you what to do. If the price difference isn’t an issue, I found SubQ to be more enjoyable to use and for me, the effects were more pronounced. But your skin isn’t my skin. And your budget isn’t my budget. So Buffet is definitely worth trying, especially if you’re trying to save money.